For 50 years, the Samuel's family and the Maker's Mark distillery in Loretto, KY held firm. With the ever increasing bottle count of some companies, Maker's Mark bucked the trend by offering one, and only one, product. Sure, they bottled it at different ABVs and slightly different ages (read: Black and Gold), it was pretty much the same as the original. Then they released Maker's 46. Even for a "new" whiskey, it's not far removed from the original Maker's Mark. Maker's 46 starts with a base of standard Maker's Mark at five years old (EDIT: Maker's Mark is actually 5.5-7 years with an average of about 6 years.Then they add a healthy dose of voodoo and bottle it. And by voodoo, I mean wood staves. They age their bourbon in new American oak (new oak is mandated by bourbon law) but that extra voodoo step is the addition of toasted, French oak staves. While their traditional American oak casks are charred (high temperature, very quickly that blackens the outer layer of wood and helps to break down some of the chemicals in the wood), the French oak staves are toasted, which happens at a lower temperature for slightly longer. This "toasting" (EDIT: They call it searing but I like toasting because toast is delicious) of the wood leaves the staves looking and smelling like freshly made toast. Two sets of these staves are inserted into the barrel (inserted into, not replacing the staves) and this is then aged for an extra nine weeks. Let's just say it makes a big difference. I like Maker's Mark but it's not my preferred bourbon. It's relatively cheap and very easy to find here in Scotland so if I want to pick some up I go for it. I can get a 750ml bottle at Costco for about 14 quid (~$23). But for me, the winter wheat just makes it too mild. It's nice for when it's hot out or I need a less aggressive whiskey for a cocktail...but I prefer a rye bite and spicy fire to my bourbon. I need "oomph". This is where Maker's 46 comes in. You can see, from the above picture, that it is a favorite. Technically, I can't claim to have demolished that entire bottle. 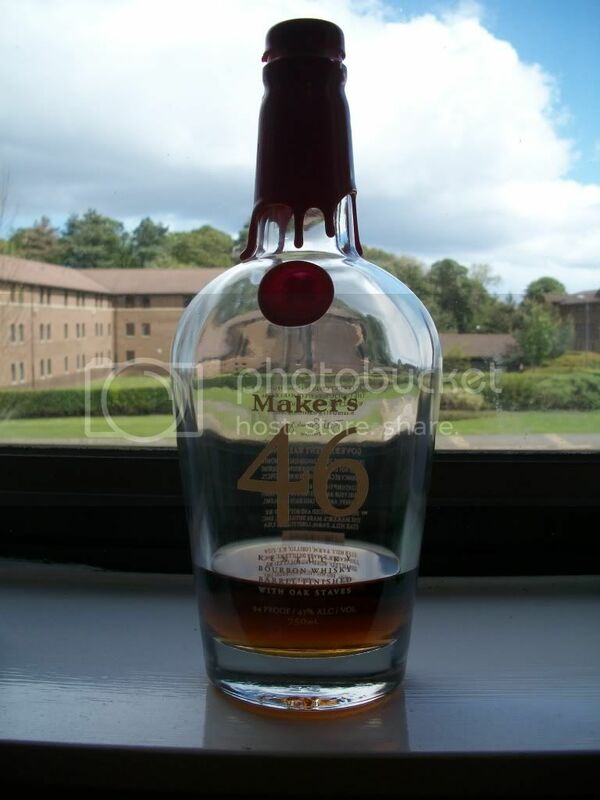 Maker's Mark was kind enough to send me a bottle of 46 to debut at the campus Whisky Society and debut it did. It was voted the favorite of the night and resulted in many other bottles leaving the room with barely a dent in them. Thankfully, the Maker's 46 was not want for attention that night. Nose: Heavy toffee. Creme brulee. Maybe maple syrup? Cayenne pepper powder. Aggressive wood too, like a carpenter's workshop. Black coffee? Ripe banana. Taste: Black pepper. Coffee follows through. Old wood (note: this isn't based on smell. I used to bite the pews in church pretending to be a T. Rex when bored during mass). Got a deeply hidden, earthy quality to it as well, which is kinda odd. Lemon oil and furniture polish. Finish is lingering and slightly tannic. 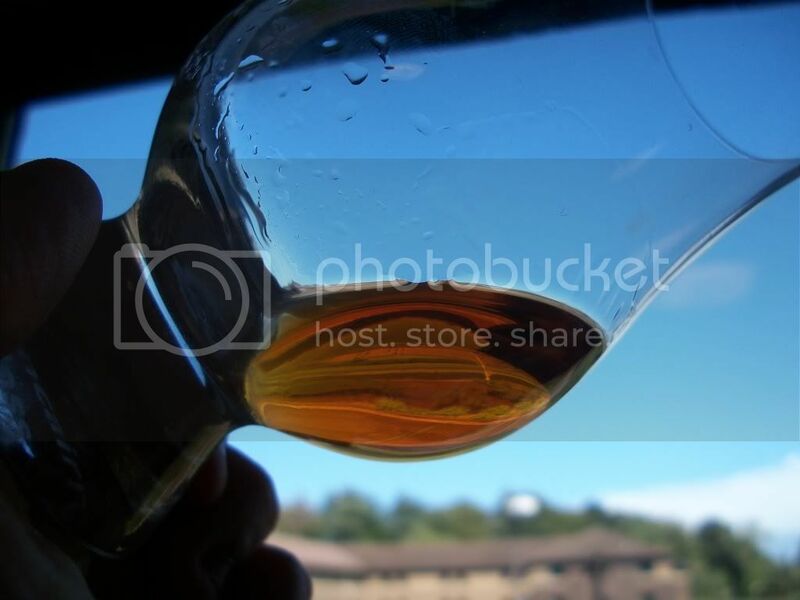 Overall, it is a skillful blend of the soft, sweet, maple sugar and vanilla qualities of the Maker's Mark but with more of a substantial, robust, and prominent flavor profile (coffee, pepper, aggressive wood). Maker's 46 is a slightly more fragrant amplification of the benefits of the standard Makers along with a hearty dash of much needed flavor potency;. And in the Bacchus household, it is much preferred.